Seize the best free Vimeo video downloader to achieve (4K/HD/SD) video download from Vimeo hassle-free. Referring to online video-sharing sites, most of us come up with YouTube the first time. However, many other similar sites have developed as strong rivals to YouTube. One of them is Vimeo. Founded over 10 year, Vimeo appeals over millions of members by its unique signature features and collects abundant video sources (SD, 720P/1080P HD, 3D and 4K). 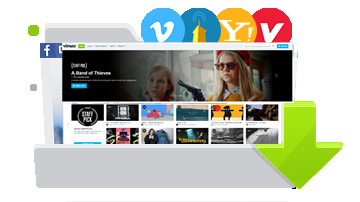 The popularity of Vimeo also leads visitors to search for Vimeo video downloader to download wanted videos from Vimeo for offline playback on computers or portable devices. What is a helpful Vimeo video downloader? The one introduced in this article is the best answer. A 100% free video downloader specially designed for free downloading 4K/1080P HD/SD videos, movies and more from Vimeo and alike sites (YouTube, Dailymotion etc.) at the fastest download speed. Why Do You Need a Vimeo Video Downloader? As a matter of fact, Vimeo offers direct download function enabling visitors to free download Vimeo videos which are shown with a Download button below the video player. In addition, visitors can choose to download different versions, mobile, SD/HD. Some of you may think that it's quite enough to download Vimeo videos in this way. Don't forget the limitations. Most of videos on Vimeo are still not available to download directly, for example videos in Staff Pick category, and the original video download can be only accessed by Plus and PRO members. Therefore, the best approach to free download any videos from Vimeo without restrictions is to seize a great free Vimeo Video Downloader. What Is The Best Free Vimeo Video Downloader? Search on Google or a third-party software download site, a diverse of results will rush to you. Description, ratings and users' reviews can give you much advice to pick out the most appropriate one. And, what you should pay more attention is whether the downloader are equipped with following features, ease of use, fast download speed, great output quality (original is the best), clean/safe downloader. Well, WinX YouTube Downloader is definitely the best free Vimeo video downloader, which focuses on offering the most convenient and fastest way to free download online videos, movies, music and more from Vimeo as well as YouTube, Dailymotion, Metacafe, Yahoo! Screen and more (300+ in total). It gives the options for users to free download any Vimeo videos in HD (720P/1080P), SD, 3D, even 4K and delivers original video/audio quality. For someone who cares security most, this Vimeo video downloader has been verified as 100% clean and safe freeware so that it will never be harmful for your computer during Vimeo video download. How to Free Download Vimeo Videos with Best Free Vimeo Video Downlader? Download and install WinX YouTube Downloader on your computer and then follow the guide to free download Vimeo videos step by step. Launch WinX YouTube Downloader and click +link-shaped button on navigation bar. Get URL of a Vimeo video you want to download. Copy and paste it to address bar of pop-up window. Click Analyze button located at right of address bar to gain video info. The title, duration, list of several versions varying from resolution, format, code and size will be given. Select one version, like 1920x1080 MP4, and click OK.
Click Browse button to set target folder (hard drive or device) and hit Download button to start Vimeo video download. Free download any SD/HD/4K, even 8K (if there is a source) videos from Vimeo, YouTube, Facebook, Dailymotion and alike sites with original video/audio quality. Quick convert vimeo videos to AVI, WMV, MOV, FLV, iPhone, iPad, Android, Windows Phone (10/8), Surface Pro, Xbox, PS3/4 etc, for more smooth playback.